The Obama administration is trying its best to ram a health care reform bill through Congress by July 31. Senate Majority Leader Harry Reid, D-Nev., announced on July 16 that he hopes to see a Senate bill passed before recess begins early August, although some lawmakers have since suggested that might not be possible. The House is also frantic to pass its own legislation. Either bill would remake approximately one-sixth of the entire U.S. economy. But that change will happen to a largely uninformed public. Although President Barack Obama campaigned on health care reform, the network media failed to supply crucial analysis of his health care agenda leading up to these pivotal votes. Since the inauguration, the network news media have promoted President Obama’s attempts to muscle through health care reform legislation. From exposing the “unhealthy details” of the current system, to openly calling it a “national shame” that the U.S. does not have universal (government) health insurance, the three networks have joined Obama’s campaign for change. In 224 stories on ABC, CBS and NBC, the networks favored proponents to critics by a margin of more than 2-to-1 (243 to 104). Networks also left out one major criticism – the “exorbitant” cost of Democrat reform proposals – from most reports. ABC touted Obama’s proposals as the “UnHillary approach” on March 5, citing the diversity of groups represented at a health care summit that day. According to “Good Morning America” co-anchor Robin Roberts, the president was bringing “all the major players in health care to the table. Only 9 percent of stories (21 out of 224) cited estimates of $1 trillion or more, even though the Congressional Budget Office (CBO) estimated one Senate proposal would cost $1.6 trillion. The networks only brought up Massachusetts health care reform in one story and entirely failed to report the flaws of a government health care program in Hawaii. They also glossed over the shortcomings of Medicare – a government-run health insurance program already bound for insolvency. Each network had its own way of spinning the debate for Obama. On ABC, medical editor and longtime universal care proponent Tim Johnson blatantly cheered for big-government solutions. ABC also aired a primetime special giving Obama time to promote his health care agenda without debate. CBS, particularly the “Early Show,” brought on administration officials to promote for government-run health care, but often didn’t supply an opposing view. NBC, the best of the three, utilized a third approach: airing stories about extreme medical hardship or praising certain hospitals for already doing what Obama has called for – like implementing electronic medical records. On June 11 and 12, after Obama had spoken in Green Bay, Wis. at a town hall meeting about health care reform, the three networks gave a perfect example of how little substance mattered in their reporting. The three focused their health care stories on Obama’s “cool” factor rather than substantive policy. In that speech, Obama admitted the cost of Medicare and Medicaid are “one of the biggest threats to our federal deficit” and promised Americans would be able to keep their doctors “no matter how we reform health care.” He also promised that reform would not add to the deficit. None of the networks examined those claims or pointed out the irony of looking to the government to cut costs since government programs are largely responsible for skyrocketing health care expenditures. Instead, they seized on a heart-tugging story of a father who allowed his 10-year-old daughter to skip school to attend the event. Obama wrote a note of permission for the girl, who “Today’s” Natalie Morales said was “Probably the most popular and coolest kid in school.” By focusing on the permission slip, all three networks ignored an opportunity to critically analyze Obama’s health care agenda. Just two years ago, the state of Massachusetts instituted its own health care reform plan. That program included some of the same “reforms” the Obama administration wants to implement nationally (mandatory insurance coverage for example). Neither Romney nor interviewer and “Early Show” co-host Harry Smith pointed out any problems with the government health care program in Massachusetts in that June 24 discussion. All three networks neglected to examine the failures of the Massachusetts model to insure everyone in the state and to lower costs. Tanner called the program an “object lesson in how not to reform health care,” since the state still has at least 167,300 uninsured, or 2.6 percent of the population (other estimates suggest that number might be as high as 200,000). The program also faces huge deficits while state health care costs have continued to rise faster than the national average. Supporters of the program claimed it would reduce the price of individual insurance policies by 25-40 percent. But according to Tanner premiums rose by 7.4 percent in 2007, 8-12 percent in 2008 and are projected to rise 9 percent in 2009. ABC, CBS and NBC also ignored the failure of the nation’s first universal health care program for children. It was implemented in Hawaii in 2008, and cancelled after only seven months. That is exactly what many critics of Obama’s health reform plan have warned. They caution that a public insurance plan would “kill private insurance” because people would dump private insurance for the government program. While Obama claims that a public option insurance plan like Medicare would increase competition in the health insurance market, many conservative health care policy experts strongly disagree. A public option would create an uneven playing field, according to analysis by the Heritage Foundation. Heritage’s Greg D’Angelo said that public plans “undercut” private insurers with lower premiums from lower reimbursements to care providers. They concluded, based on Lewin Group data, that 107.6 million people could lose private employer coverage under such a plan. That number is equal to one third of the entire U.S. population. President Obama has plainly stated his desire to see a public option insurance program in any health reform bill passed by Congress. On June 15, he told the American Medical Association (AMA) “one of these options needs to be a public option that will give people a broader range of choices.” In that same speech, Obama tried to calm fears that a public option would have a payment structure similar to Medicare. All three networks admitted that a public option plan, like the president wants, would be “similar to Medicare” which is the existing federal health insurance program for people 65 or older. But not even that ABC report asked how the federal government would prevent fraud from occurring in yet another, much larger, government program. According to Obama, the rationale for health care reform is to reverse “the rising cost of health care.” Yet, Medicare is one of the very reasons health care costs are exploding – a fact the networks didn’t point out, even though the president himself admitted it. On June 11, a few days before Obama addressed the AMA, he spoke at a town hall meeting in Green Bay, Wis. “For the government, the growing cost of Medicare and Medicaid is one of the biggest threats to our federal deficit,” Obama said. The author of that study, Jeffrey H. Anderson concluded that government-run health insurance is not the solution. “Costs have risen faster under government-run care,” he said. Johnson didn’t address the problems Medicare has created for patients like Barbara Plumb when doctors decide to opt out. Plumb, a Medicare recipient, found out that her gynecologist was opting out of Medicare (a result of lower reimbursement rates and “too much” hassle) according to The New York Times. When she asked her primary-care physician for a recommendation the doctor said she didn’t know any gynecologists who would take Medicare. Network journalists have helped sell the “need” for health care reform for years by complaining about the crisis in the number of uninsured Americans. But that “crisis” has been amplified by inflated numbers and lack of detail. Robin Roberts claimed on “Good Morning America” April 29 that “50 million Americans” are uninsured, as did Natalie Morales on June 11 “Today.” That figure is off by roughly 14 million people – just for starters. While the Census Bureau said that there are 45.7 million uninsured people (including nearly 10 million non-citizens) in the U.S., network reporters and anchors continue to falsely claim that there are 47 million to 50 million Americans uninsured. Between Jan. 20 and June 24, 80 percent of ABC, CBS and NBC statements about the number of uninsured were inaccurate. Only NBC “Nightly News” and ABC “World News” never got it wrong – by not citing the national number of uninsured at all. In addition to inflated statements about the uninsured, reporters rarely broke down the data to shed light on who might be in real need of government assistance. According to the Census Bureau, the overall number of uninsured included nearly 10 million non-citizens and more than 17 million people who made at least $50,000 per year (the median household income is $50,233). Two economists working at the National Bureau of Economic Research concluded that 25 to 75 percent of those who do not purchase health insurance coverage “could afford to do so.” Additionally, an Urban Institute study found that 25 percent of the uninsured already qualify for government health insurance programs. But one Senate plan to “reform” health care currently under consideration (sponsored by Sens. Kennedy and Bachus) would still leave roughly 36 million people uninsured according to the CBO and reported by The Washington Times – despite its $1.6 trillion price tag. Only two network stories admitted that plan would leave about that many people uninsured (one report cited 35 million, the other 36 million), despite Obama’s campaign promises to achieve universal coverage. Obama campaigned for health care reform to solve rising costs and “lack of accessibility” as far back as 2006. It was a focal point of his run for president, so the media had plenty of warning that health care reform was a major part of his agenda. Almost as soon as Obama took the office of president he made health care reform a top priority. And the network news media have followed his lead and reiterated his perspective about health care at critical points since Jan. 20. ABC, CBS and NBC barely covered the topic until Obama pressed the issue and then – as if on cue – ramped up the number of stories. On Feb. 24, Obama addressed a joint session of Congress and the American people. In that speech, he made it clear that health care reform would not be postponed. “I suffer no illusions that this will be an easy process. It will be hard. But I also know that nearly a century after Teddy Roosevelt first called for reform, the cost of our health care has weighed down our economy and the conscience of our nation long enough. So let there be no doubt: health care reform cannot wait, it must not wait, and it will not wait another year," Obama adamantly declared. That week also marked the first spike in health care stories on the networks under president Obama. ABC, CBS and NBC aired 27 stories about health care that week, nine more than they had run in the previous five weeks combined. ABC’s “Good Morning America” ran an attack on private insurers Feb. 26 – two days after Obama’s speech. That piece was a horror story about Charles Tucker, a man who developed MS only to have the insurance company reject his claim. “GMA” interviewed John Morrison, the former Montana insurance commissioner, who accused insurers of using “hired gun physician opinions in order to deny claims.” That story featured three people attacking insurers to one defender: Susan Pisano of America’s Health Insurance Plans. At the very end of the story, Chris Cuomo admitted that the company was now paying Tucker’s claim. The next week, Obama launched HealthReform.gov and hosted a White House forum on the issue on March 5. The networks’ response was to air 28 stories about health care between March 1 and 7. Obama also gave a mid-day speech on May 11 about health care reform. The networks devoted 17 stories to the issue that week (May 10-16). On “Good Morning America” the day of Obama’s speech, Diane Sawyer called it “D-Day” for health care reform. Beginning with the second week of March and leading up to June 7, coverage ranged from one health care story in a week to as many as 17. But Obama’s big “kickoff” for the health care reform debate came on June 5. The networks took it as a cue to increase coverage of the issue. 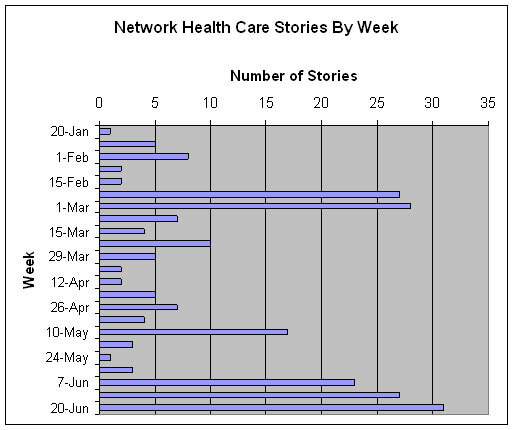 Between June 7 and June 24 the networks aired 81 health care stories (23, 27 and 31 per week). ABC even decided to air a primetime special with the president from the White House on June 24, “moderated” by anchors Charles Gibson, Diane Sawyer and medical editor Tim Johnson. From advertising for the left-wing group Families USA – which promotes universal health insurance – to decrying the “tragedy” of the current health care system, ABC supplied the most egregious examples of cheerleading for ObamaCare during the study window. Some of ABC’s reports were balanced, but those were outweighed by medical editor Tim Johnson’s crusade for universal government-run health insurance. Though he only appeared in nine stories, Johnson’s blatant advocacy and ABC’s reliance on him as an “expert” on health care reform resulted in the worst coverage of the three networks. Diane Sawyer gave Johnson the title of “expert” on March 2, but his expertise was limited to only one side of the health care debate. From the beginning of Obama’s health care reform launch, Johnson’s agenda lined up with the president’s. On March 2, Johnson said that Obama would get his way on “universal” coverage. “I think there's going to be an intense, partisan debate. But ultimately, David, there is just one fact I want to let everybody hear: We spend more than twice as much, per person, on health care in his country as the average of all other industrialized countries, yet we're the only one that doesn't have universal coverage. That's a national shame and I think ultimately that's what's going to unite Democrats and Republicans,” Johnson said. More recently, Johnson lauded the president’s “tender moment” with AMA doctors in Chicago. His glowing praise for Obama’s health care agenda comes as no surprise though. There was one particular aspect of Obama’s reform agenda that reporters avidly praised: electronic medical records. Network reports called them “the electronic future” and a step that would save lives. While reporters like Robert Bazell of NBC said that this is “part of almost everyone’s view of the future of medicine,” critics of electronic medical records were ignored. A number of newsmakers and celebrities – from George Clooney to Rush Limbaugh to Farrah Fawcett – have had their medical information compromised. In Fawcett’s case, the “Charlie’s Angels” star had her most personal medical information leaked to tabloids as she battled cancer. Cost can also be a huge obstacle to adopting electronic medical records. According to USA Today, upfront costs can be as much as $36,000 per doctor. Is there an alternative to government-run care? Conservative health care policy experts argue that government is the root of problems in the U.S. health care system, so increased government involvement is not the right solution. Instead, they propose making the health care market freer. Dr. David Gratzer, senior fellow at the Manhattan Institute and author of “The Cure: How Capitalism Can Save American Health Care,” advocates deregulating the health care system. He says that Congress should make it possible for people to buy health insurance across state lines, allow companies to band together to buy insurance and end the tax discrimination against the self-employed. Gratzer says those three solutions would utilize competition to lower costs and increase coverage. Michael Cannon, Director of Health Policy Studies at the Cato Institute, also said there is a way to drive down health care costs with a free market and proper incentives. “Let individuals control their health care dollars, and free them to choose from a wide variety of health plans and providers. If Congress takes those steps, innovation and market competition will make health care better, more affordable and secure,” Cannon wrote July 16. How would that happen? Cannon advocated two big changes, including giving Medicare enrollees vouchers to choose any health plan and “keep the savings if they choose an economical plan.” Second, Cannon said Congress must give the same tax breaks to people purchasing their own insurance as those receiving job-based insurance coverage. Another prominent health care policy expert, Grace-Marie Turner, founder of the Galen Institute and a BMI adviser, told the Senate Committee on Commerce, Science and Transportation July 16 that private sector innovation is “vital to progress in health care” and more “adept” than government programs. Turner cited a number of employer innovations, including Safeway’s wellness incentives, Target’s use of health savings accounts” and Wal-Mart’s wide array of health plan options for its employees. The Business & Media Institute analyzed stories and briefs including the term “health care” from morning and evening shows on ABC, NBC and CBS between Inauguration Day (Jan. 20, 2009) and the day of ABC’s primetime health care town hall (June 24, 2009). BMI assessed the non-journalist voices in each story and categorized them as proponent, opponent and neutral. Proponents were anyone whose comments were used to support government-run care and critics were the opposite. Since Obama’s inauguration, the network media have limited debate over health care reform. Network reporters violated the standards of their own profession by not balancing proponents and opponents of ObamaCare, downplaying huge costs, letting the administration drive coverage, not exposing government health care failures and in some cases openly advocating for universal care. The SPJ Code of Ethics states that journalists should “support the open exchange of views, even views they find repugnant,” “give voice to the voiceless,” and “distinguish between advocacy and news reporting.” They should also “avoid conflicts of interest, real or perceived.” But that wasn’t how many network journalists handled the essential health care debate. More network stories needed to be like Sharyl Attkisson’s CBS “Evening News” report on June 23. Her report also included ObamaCare critic Cannon, who explained that Obama’s plan would cause employer premiums to rise “and employers might respond by dropping coverage entirely” effectively ousting people from their insurance plans.